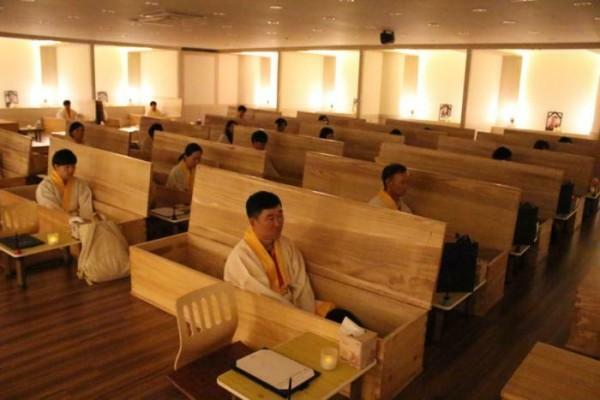 In South Korea, where the rate of suicide is on the rise, a former funeral director has established a "death experience" therapy center to help people understand the benefits of not killing yourself. Participants at the centre come from all walks of life, including teenagers who struggle with pressure at school, older parents experiencing isolation, and the elderly who are afraid of becoming a financial burden on their families. They all don white robes and get into coffins arranged in rows. Beside each coffin is a small desk with pens and paper. Students sit inside the coffins and listen to a short talk by Jeong Yong-mun, a former funeral worker who is now the head of the healing centre. He explains to them that they should accept their problems as a part of life and try to find joy in the most difficult situations. The students then lie down in the coffin and close their eyes to have a ‘funeral portrait’ taken. Afterwards, they write down their will or compose a farewell letter to their loved ones, and read their last words aloud to the group. When the ‘hour of death’ approaches, they are told that it is now time to ‘go to the other side’. Candles are lit and the ‘Korean Angel of Death’ enters the room. The students lie down in their coffins once more, and the angel closes the lid on each one of them.